Antonio Lai, a trailblazer in Hong Kong’s bar industry, has single-handedly popularised some of the city’s most renowned and progressive cocktail bars including Quinary (No. 7 on Asia’s 50 Best Bar List in 2017), Ori-gin and The Envoy inside the quaint Pottinger Hotel in Central. 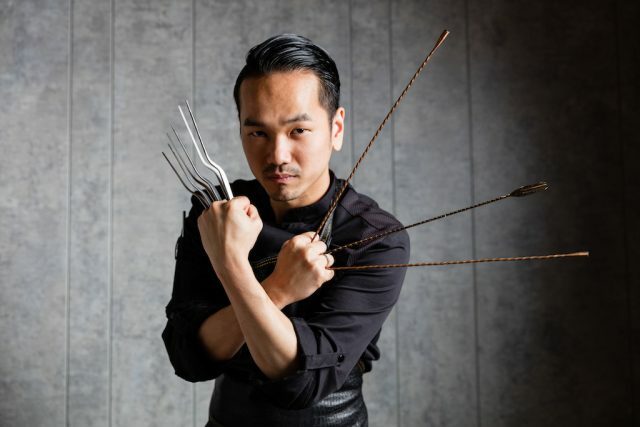 Credited for introducing the ‘Multisensory Mixology’ (MM) concept in Hong Kong – a drinking experience that aims to evoke all senses – after studying in Italy, Lai was crowned the Hong Kong and Macau’s best bartender at the regional level of 2015 Diageo World Class. In a chat with dbHK, Lai lauded the often overlooked vodka as an apt translator of flavours and the merits of simple drinks. While identifying the use of extravagant glassware as the current cocktail trend sweeping across Asia, Lai also admonished bartenders who treated their job as a lifestyle, not a career. What led you to be behind the bar? A talkative childhood and active personality. When I was in school, the teacher always complained to my mother that I was too talkative in class. On top of not being able to sit still for too long, I needed to find some work which would allow me to talk a lot and move around a lot – and that led me to a job behind the bar! Vodka. Being the notorious child of modern mixology, many people have turned their noses up at vodka for its characteristics – colourless, odourless and tasteless. But that is a huge misconception! There are nuances in flavour and texture, but the greatest joy is discovering its use as a vehicle to translate a galaxy of flavours onto the human palate. The possibilities are endless! What are the best and worst things about the industry? Best: Bartenders are being perceived as respected professionals, on a par with sommeliers and chefs, as cocktails gain more culinary credentials. Worst: Bartenders who treat their jobs as a lifestyle and not a career, like getting irresponsibly drunk and moving jobs at the drop of a hat. If you had to be a particular cocktail or spirit, which one would you be? I love working with local and seasonal ingredients but one of my favourites would be a Bellini with fresh, ripe Japanese white peaches. Another favourite would have to be anything made with Kyoho grapes, which are available in the late summer and early fall. Coffee Bar K in Osaka because it was there that I first came across the wonderfully crafted cocktails and choreography of the Japanese bartenders. Extravagant glassware can be found in every cocktail bar these days, from copper pineapples to flamingo floaties. It is a trend that’s getting crazier by the day! What’s one cocktail trend that you wish the industry can get rid of at the moment? Perhaps bartenders could place less emphasis on cocktails with too many ingredients where you can’t identify the core flavours. Simple drinks can be tasty too. Topped with Earl Grey Caviar and Foam.